Barren Earth garnered a fair amount of deserved attention and accolades with their debut release, Curse Of The Red River. Mixing an atmospheric brand of death metal that recalled the early days Paradise Lost along with different phases of Amorphis while keeping a distinctly progressive edge alive as well, the whole package lived up to the big namepower of the band's members. 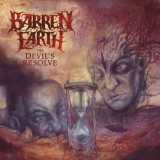 Their second album, The Devil’s Resolve, takes a similar path while upping the progness a little bit. The epic opener Passing of the Crimson Shadows and White Fields with its twisted riffage have a clear vibe of early 2000 Opeth in them. The playing has a tight groove to it and the folky acoustic elements are spread evenly and seamlessly along the soundscape. Singer Mikko Kotamäki (Swallow The Sun) delivers the goods on the mic with both the growls and the cleans. The Dead Exiles drop the anvil of doom onto the listener with the kind of grandiose power that really makes you feel the Candlemass-style punishment. The flute-intro in As It Is Written takes the listener’s mind to Stonehenge where dancing druids make you wait for the middle section that unleashes some Emerson, Lake & Palmer on your arse. The biggest highlights of the record, Oriental Pyre and Where All Stories End, feature the kind of magical choruses that make you reach out for the repeat-button with the quickness. Take all this and slap on a very strong production job by the Swedish sound wizard Dan Swanö and I dare say we’ve got one of the strongest Finnish metal offerings of the year that could easily end high on the global listings as well. For Barren Earth, it’s also a very commendable step ahead from a debut that expectations pretty high. Their future certainly looks bright.